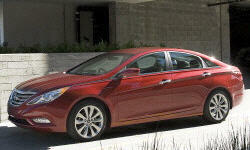 Why the 2013 Hyundai Sonata? This car has some serious kick for a 4 cyl. engine. I never have issues merging on the highway or passing other vehicles. It really is fun to drive in that aspect. Definitely faster than my old 01' Accord. The front driver seat is supportive yet firm and the power adjustments guarantee you'll get the right driving position for you. The heated seat feature is great on a cold morning too. You get a lot of bang for your buck! Power heated seats, 18 in. alloys, XM/Sirius availability and more horsepower than most of the competition. I also like the variety of little cubbies and pockets that I can store things in. There are cupholders in the center console as well as in the pockets in all four doors. Handy if you and your passengers are thirsty. I paid $17,600 for all of those features and driving fun and my car was only 1 year old. Can't beat that deal! Why Not the 2013 Hyundai Sonata? Although I haven't experienced the wandering steering complaint that seems to be common with these cars, I have notice things that I really don't like about the handling. This is by far the worst vehicle that I have ever driven in the snow, especially with the crappy stock tires. One time I got stuck in my own driveway so badly that I had to be towed out by AAA the following morning. Going uphill in the snow is a nerve wracking experience and any sort of winter weather driving is not safe without snow tires. I think the traction control system may have something to do with it as well because it is better when I shut it off. Think twice about buying this car if you live in an area that gets any measurable amount of snow. The headlights are very dim on this car. I frequently have to drive on dark rural roads to get home and I can barely see more than 100 feet ahead of me. The windshield wiper speed is often either too fast or too slow and I often have to manually control the speed to get it where I want it. The stock Hankooks that came with my car at 16,400 miles were well on their way to being bald and were terrible in the snow. To me, this is unacceptable at such low mileage. I had to buy two sets of tires for my fairly new car just to be able to get around during the winter. Not a good start to my Hyundai ownership experience. That old saying "You get what you pay for", it's absolutely true. This car is nowhere nearly as well built as my old 2001 Honda Accord and it shows. My car has numerous chips in the paint and is starting to develop surface rust on the exterior and inside the door jams. I had to replace the battery when it was a little over 3 yrs old and the radio occasionally shuts itself off and on at start up. The driver's side door and front quarter panel are no longer lined up. I am not impressed with the way this car has aged. It would be unfair to say that this car has been a total lemon because it hasn't but parts have failed on it earlier than I would have expected. I had to replace the high pressure fuel pump at 35,000 miles and the rear O2 sensor at 55,000. I have heard about engine failures in 2011 Sonatas and got a notice that my model year is also included in this recall. It makes me uneasy to have had some of the prior issues and then have to worry about my engine on top of that. While this car hasn't been completely terrible, overall I have been disappointed with it. I owned a 2001 Honda Accord before this vehicle. Outside of maintenance and a couple of suspension repairs, I had no issues before the 150,000 mark. My Sonata is not aging well and I don't have much confidence in its future. I am currently researching and saving for a replacement. If you really must experience a Sonata, I would recommend you lease rather than buy to enjoy all the fun things about it without the headaches that will come later.